The 2nd Seaforth's around 1939. Bernard Finn is the 3rd from the left, front row. He was killed at Le Tot/St Sylain 11th June 1940. Front row, fourth from the left is Sergeant Alex (Allie) MacKay, late of Queen Street, Invergordon. 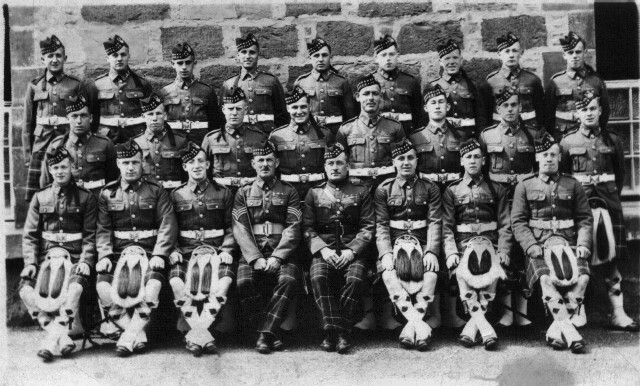 I believe it is not commonly known that in 1940 it was Highland soldiers who were the last to fight the Germans on European soil until the Normandy landings in 1944. The Dunkirk evacuation was completed on June 4th 1940 so Bernard Finn was killed a full week after it is generally assumed that the remnants of the British Army were safely home. My cousin Richard Geddes (also a Seaforth) was killed on June 6th near Abbeville during the retreat that ended in defeat and capture at St. Valery on June 12th. The 51st Highland Division surrendered at 10am on that day due to overwhelming odds and because French forces had already given up. A heroic stand by men who came mainly from Ross-shire and yet this was never mentioned in history class when I was at school. St. Sylain is well South of St. Valery centre so Bernard must have been involved in trying to hold the perimeter round the town, or else he was part of a breakout trying to head for Le Havre. Bernard Finn, alone against the Nazis would have been among the last to die...an Invergordon hero. Back row 3rd from right could be my grandfather Eckie Murray. It certainly looks like him and the details are correct.